Nowadays, the average word count of a Google first page result is 1,890 words. Thanks to a continual onslaught of algorithm updates, Google has learned that better content wins. Keyword stuffing and bizarrely formatted pieces on “best Swiss watches” have made way for more comprehensive content. 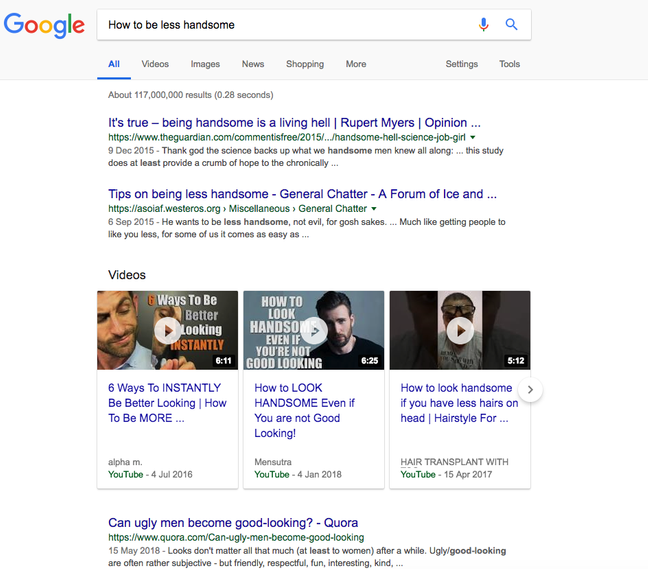 But why is better content killing it in on Google? If you’re already a big deal, a short blog post is enough to keep your customers engaged with your brand (marketing legend Seth Godin often puts out posts under 50 words long). However, you’d still be leaving traffic on the table. In a recent Whiteboard Friday, Moz founder Rand Fishkin talked about the 10x principle of SEO. Basically, to get noticed in the search engines, you have to be willing to craft pages that are 10 times better than the current leaders. Generally, you can expect content which is more thorough to be shared more frequently. This is especially true for Twitter, which is where all the deep thinkers (and casual racists) tend to hang out. It’s human nature. We want to look smart. We share stuff that makes us look smart. 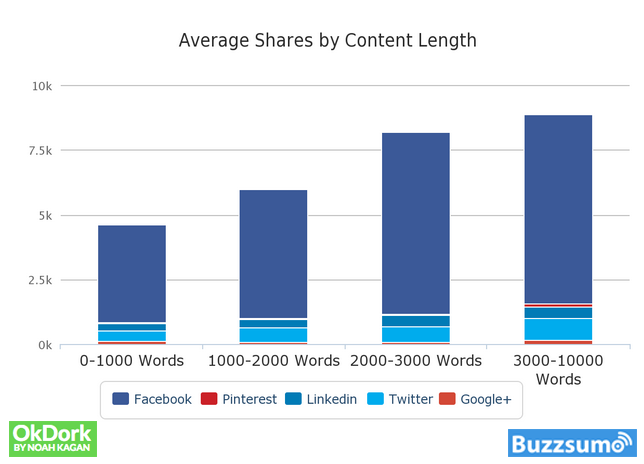 Research from OkDork shows 3,000-10,000 word content gets the most average shares (8,859). There’s also a lot of scope to succeed with long-form content because not that many people are doing it right. The research also showed that for every in-depth post over 2000 words long, there were about 16 sub-1000 word articles out there not getting very much love. If you’re willing to put the effort in, the internet is waiting to reward you. A great reason to go in-depth with your content strategy is that you begin to rank for entire groups of keywords rather than a handful of curated phrases. In the early Google days (sometime between boy bands and Instagram), a fair degree of highly-focused keyword stuffing could get you places. Now, it’s more likely to get you penalized. Google’s mastered semantic phrasing, and this means SEOs are learning how to speak like (very geeky) humans once again. You’re seeing a list of semantically-related searches – stuff that isn’t your exact keyword, but your keyword and these words are all pretty good buddies. They share an apartment and everything. Over time, Google learns to put stuff together. Kind of like how Amazon groups “customers also bought” things together to show you what’s similar to your query. We shouldn’t be surprised that a massive information conglomerate is getting good at… information. With every algorithm update, the picture becomes clearer: Google are out to make search results increasingly relevant to the query. Google is famously guarded about what factors influence search rankings, but with the introduction of “Rankbrain” we’ve been seeing an interesting factor come into play in the results page: User Experience (UX). Links matter. Authoritative links matter more. Relevant, authoritative links are gold dust. But what gets you to the top of Google may not keep you there. Here’s where experience comes in. Bounce rate: Did the visitor go to another page on your site or just “bounce back” to the search results? 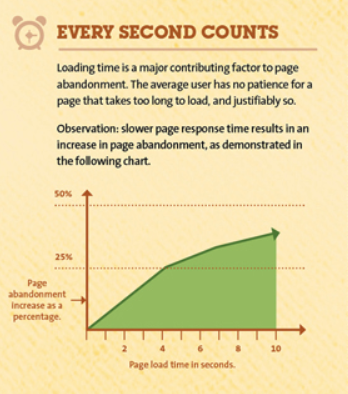 Time-on-page or dwell time: How long did they stay for? A 3-second bounce is a whole lot worse than a 3-minute one. Site speed: Not only do more people bounce every second of load-time, but Google can test your site speed before any visitors give your page a chance. 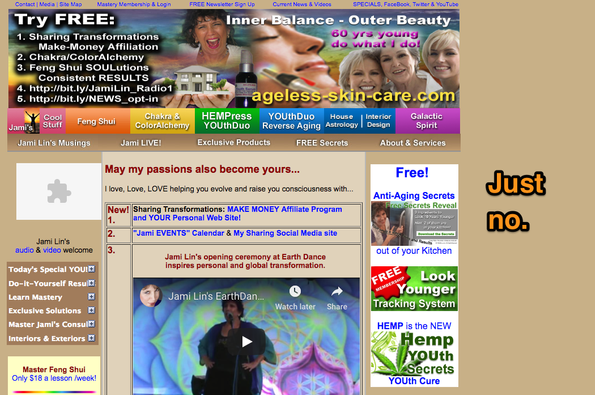 Visitors found your page because of a search. They’ll stay on your page because it scratches that itch. But useful content can still fall at the last hurdle: design. Visitors are increasingly conscious of the look and feel of a site, and are less likely to share and link to content which they find to be visually repugnant. More importantly, it’s harder to get customers to convert if your design isn’t very clear. Simplifying design helps your customers and helps you in the SERPs. Typography: Fonts, italics and bolding have a huge impact on how someone receives your message.There are some great typography tutorials online for beginners. You know content isn’t going anywhere. Customers connect to brands, research and gain confidence through the content they consume. This is true for B2C companies offering big purchases, and it’s especially true for B2B brands, where decisions are often made my groups of stakeholders. 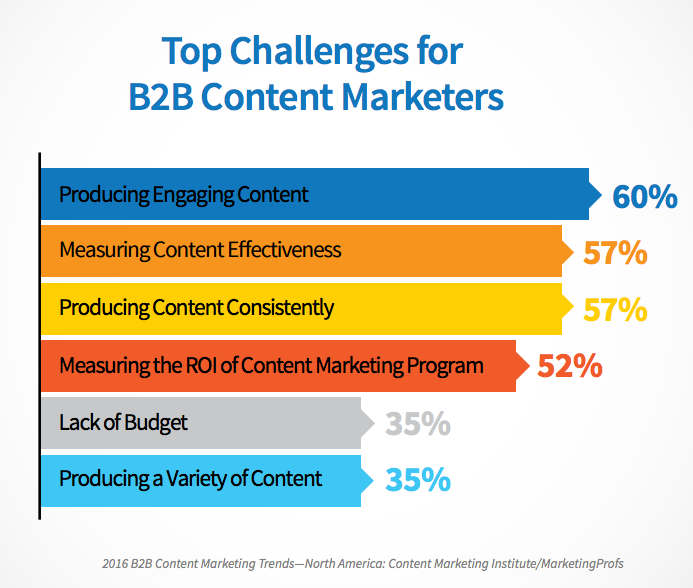 It’s a common pain – 60% of B2B marketers cited “Producing engaging content” as their top challenge. Becoming strategic about your content can smooth out the process and ensure you’re delivering something valuable regularly. Collaboration is awesome, but tasks only get done when it’s someone’s job to complete them. You need just one person in your organisation who can handle oversight of generating blog posts, case studies, lead-magnets, etc. If you’re a small outfit, this is probably you or your CMO. But if you’re ready for a new hire, a Chief Content Officer (CCO) might be for you. Publication: Getting stuff out on the blog, Youtube channel, podcast feed, etc. Consistency can be key here, but when it comes to producing content such as blog posts quality always beats quantity. For example, Brian Dean scaled his site Backlinko and quickly became the darling of the SEO world with only occasional, incredibly in-depth blog posts, such as his now well-known piece on content creation/promotion called The Skyscraper Technique. 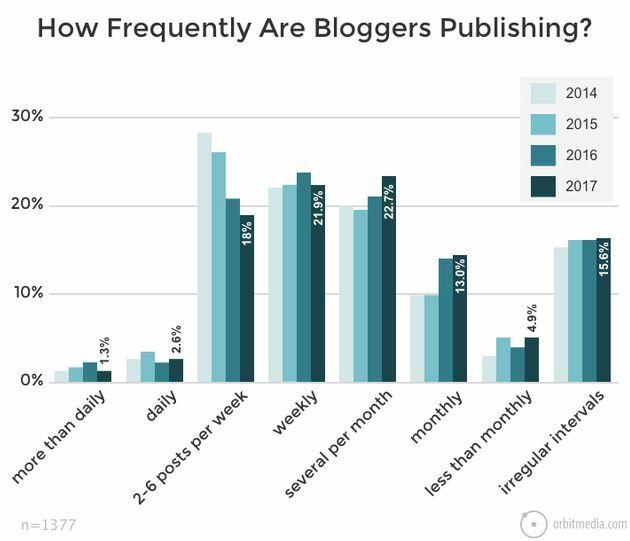 According to Orbit Media’s 2017 survey of 1337 bloggers, posts are taking longer to write. In fact the average post now takes a whopping 3 hours and 20 minutes. It’s not surprising then that businesses are blogging less frequently, but putting more time into each piece of content. That said, you still need to plan for content to actually happen. Don’t aim for daily posts if you can’t manage something worthwhile. Even weekly might be a challenge if you don’t have the right management in place (see above). Instead produce content as often as you can produce quality. Using a content scheduling tool like CoSchedule can help with creating a consistent editorial calendar, but the obvious free platforms for team project management like Trello or Asana can work just as well. Want to get results from content, but don’t want the hassle of taking on extra employees to test this new strategy? Increasingly, talented individuals are moving towards independent work setups (myself included), and companies (large and small) are depending on them for help. Freelancing is here to stay, and businesses who are able to source reliable freelancers and keep them on side will have the upper hand when it comes to staffing in the very near future. Nothing can top a good word of mouth recommendation, but failing that, here are some great places to get started. But just be aware that you’ll probably go through some less-than-perfect hires before you find the right fit. And, obviously, there’s always me. If you enjoyed this post any want in-depth content in the B2B SaaS/marketing space, then we should totally hang out. I only write content in this space and help you with your content marketing goals. And if you need help in producing that 10x content, you know where to find me. What do you think? 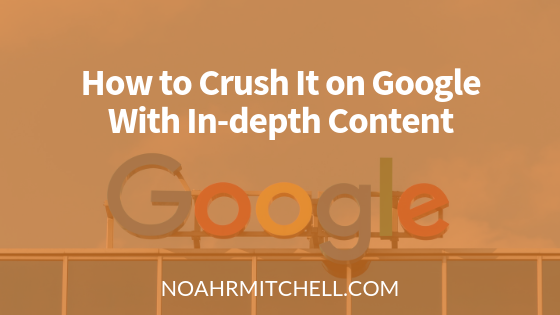 How are you using in-depth content to find success on Google?